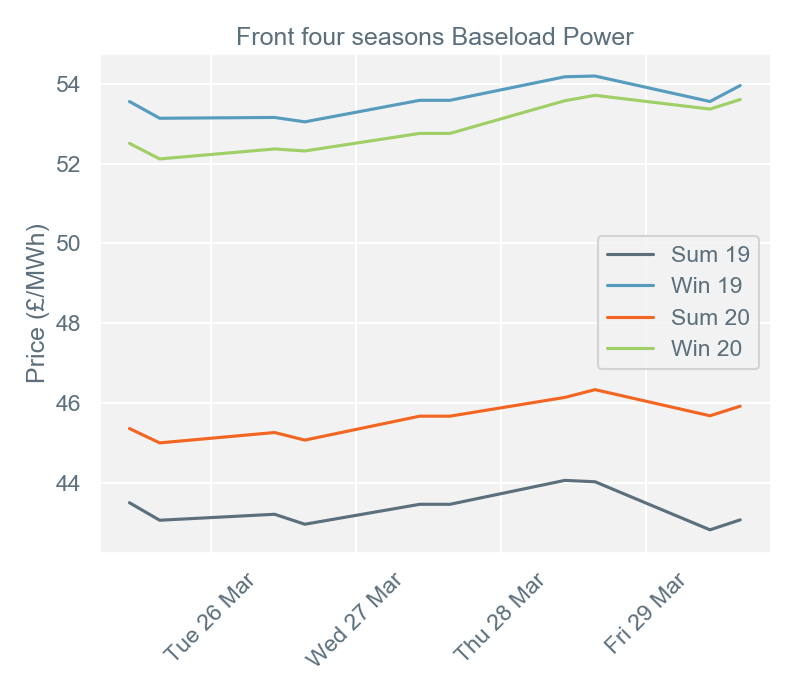 Day-ahead baseload power prices averaged £41.85/MWh during week 13, £1.83/MWh down from week 12. The highest price for day-ahead baseload power was £43.19/MWh on Friday 29 March. National Grid forecast that wind output would exceed 5GW in the morning, before dropping over the course of the day. 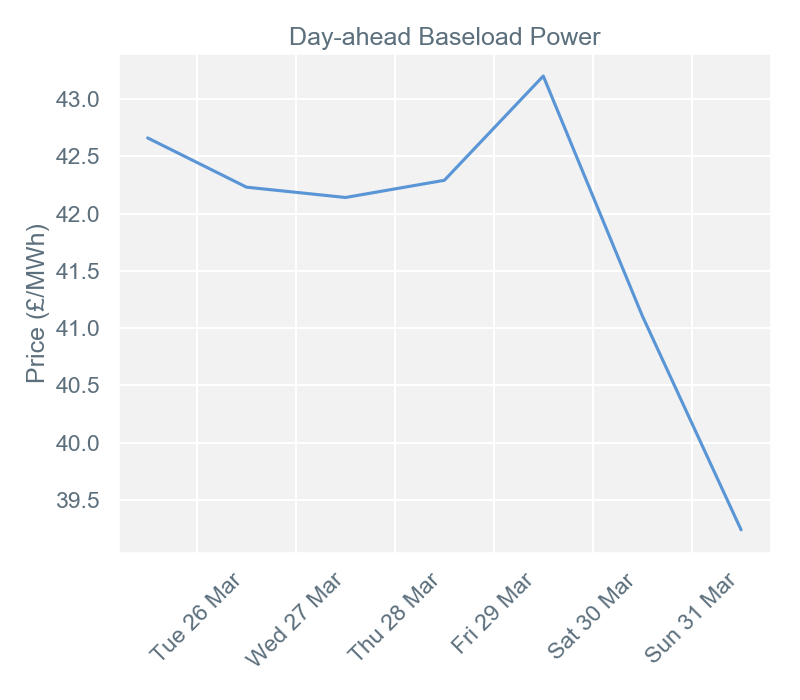 The lowest price for day-ahead baseload power was £39.25/MWh on Sunday 31 March. UK demand was low for the day, averaging 29.8GW while the national temperature average was 8.7°C. The low demand, combined with the high number of Liquefied Natural Gas (LNG) cargoes arriving in the country, pushed the day-ahead price lower. This pressure is likely to continue in the coming weeks, since the UK is set to receive up to nine LNG cargoes between 28 March and 14 April. 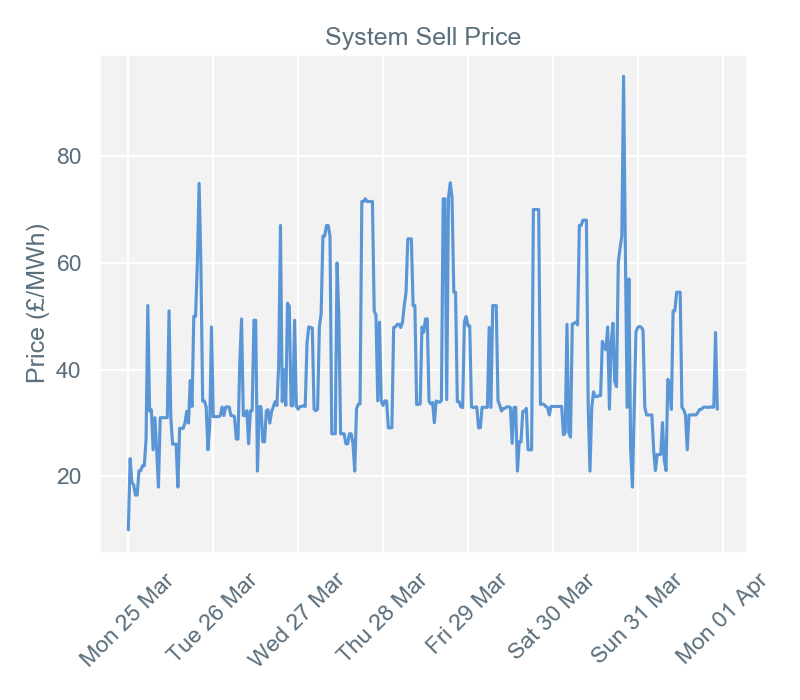 Settlement period 41 (20:00 – 20:30) on Saturday 30 March saw the highest imbalance price during week 13. The system was short of power and, with no solar and low wind levels, National Grid had few options to balance the grid. The systems operator set the final price of £94.95/MWh by accepting Dinorwig power station’s offer to increase generation using pumped storage hydro. Settlement period 1 (00:00 – 00:30) on Monday 25 March had the week’s lowest imbalance price of £10/MWh. Even though it was the middle of the night, national demand increased by 500MW. With wind already high at 12.5GW, National Grid had to increase gas generation to meet the demand (although the source of the extra generation is unpublished). Renewable generation in the UK saw solar enjoy its strongest week this year, while wind was lower than it has been in recent weeks. Wind generation averaged 5.1GW throughout the week – compared to 12.2GW from week 11 and 6.1GW from week 12 – and peaked at 12.5GW on Monday 25 March. Since this happened just after midnight, it accounted for 47.1% of the UK’s generation stack. 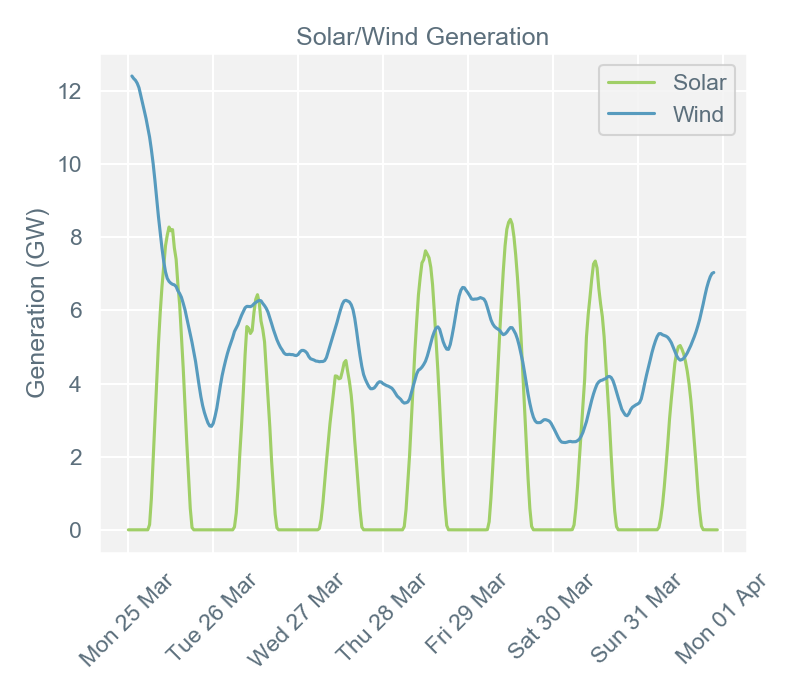 By comparison, solar generation was strong in week 13, reaching over 5GW every day except Wednesday 27 March. It peaked at 7.8GW on Friday 29 March, when it amounted to 20.2% of the total stack. These two renewables together peaked on Monday 25 March, when wind was 6.9GW and solar 7.7GW - a combined contribution of 31.6% of the UK’s generation. Secure and promote* (Seasons +1, +2, +3, +4) baseload contracts gained some value over the course of week 13, gaining on average £0.41/MWh. This ended the three-week run of bearish (downward) movements that began in week 10. The week started with conflicting signals. On Monday 25 March, most UK curve contracts opened with higher prices than at the previous Friday’s close due to stronger fuel and carbon prices. However, weakness on the National Balancing Point (NBP) gas market wiped out these gains later in the day. Tuesday 26 March offered more consistent direction, with movements fuelled by gains on the European carbon and coal benchmarks. The Rotterdam coal front-year product closed more than $1/tonne above the previous day’s settlement and the Carbon Dec-19 European Union Allowance (EUA) benchmark product was trading almost €0.50/tCO2e (tonnes per carbon dioxide equivalent) above Monday’s settlement. Wednesday 27 March saw similar movements to Monday. Both the EUA carbon Dec-19 product and Brent Crude Oil pushed upwards throughout the day, only to lose momentum toward the session’s end. The NBP gas market drove most of the price movements on Thursday 28 March. It opened higher than Wednesday’s closing price due to being slightly under-supplied, which meant that near term gas and electricity contracts saw some premium creep back in. 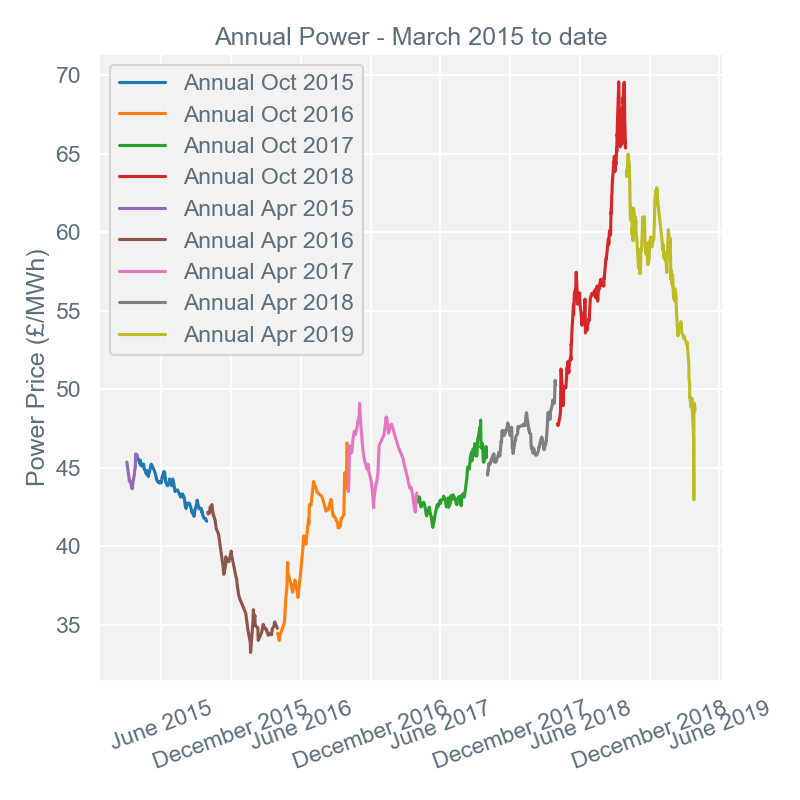 On Friday 29 March, power contracts shed value as the electricity curve softened in response to weaker fuels and carbon prices.